The Gallic Church had its beginnings in the first century. Western tradition holds that Gaul (France) was initially evangelized and baptized by St. Mary Magdalene, St. Lazarus the Four-Days Dead, and his sisters Sts. Mary and Martha. On the basis of St. Paul's second Epistle to Timothy, several historians have thought that the Apostle Crescens, an envoy of St. Paul, labored in Gaul. Some also think that St. Paul stopped in Gaul on his way to Spain. In any event, Christianity penetrated into southern Gaul at an early date, specifically into Provence and the Rhone Valley — areas that had a strong presence of Greek minorities hailing from Asia Minor, Phrygia and Syria. The written history of Orthodox Gaul begins in the second century with the Church of Lyons, which in the West was second only to Rome in authority and influence. Its first bishops were Sts. Pothinus and Irenaeus. St. Pothinus was among the Christians martyred by Emperor Marcus Aurelius in A.D. 177. Pothinus' Acts, included by Eusebius of Caesarea in his Ecclesiastical History (Book 5, Chapter 1), are considered some of the most beautiful writings of the ancient Church. St. Pothinus' successor was the Hieromartyr Irenaeus, who had known the Hieromartyr Polycarp in his youth in Smyrna, the latter in turn having been a disciple of the Apostle and Evangelist John. The writings of St. Irenaeus of Lyons are numbered among those of the Holy Fathers of the Church; through them St. Irenaeus' influence soon reached both Asia Minor and Egypt. Other cities also had martyrs and saints, even though persecutions were less intense in Gaul than in other regions of the Empire. The most venerated of these holy servants of Christ are St. Victor of Marseilles, St. Saturninus of Toulouse, St. Symphorian of Autun, Sts. Marcellus of Chalon-sur-Saone and Valerian of Tournus, St. Dionysius (Denis) of Paris, St. Maurice of Agaune and the martyrs of the Theban Legion, St. Julian of Cenomanis (LeMans), St. Taurinus of Evereux and St. Patroclus of Troyes. In the middle of the third century the Narbonne region and Celtic Gaul had more than thirty bishoprics. Local synods (councils) were held under the auspices of the Archbishop of Arles, and were attended by clergy from throughout Gaul and even from Britain. The number of bishops continued to increase until the end of the century, as the country painfully recovered from the Alemanni invasion of 257. Having been spared the persecution of Diocletian thanks to the moderation of Caesar Constantine Chlorus, the Church of Gaul was able to organize itself in peace even before the era of Caesar Constantine's son, St. Constantine the Great. Still, on the eve of the 4th century, the Church in Gaul did not yet comprise a distinct “national Church,” as did the Churches of Antioch and Alexandria. Monasticism initially took root in the East, but at an early date the West received a model for this way of life in the personal example and writings of St. Athanasius of Alexandria, who lived in exile in Treves, Gaul, beginning in 335. Since Athanasius knew St. Anthony the Great and had found refuge among the monks of Upper Egypt during a period of great danger, one can surmise that the Gauls heard at this time about the blessed Anthony and the ascetic exploits of the Egyptian monks. In the 4th century the fire of Christianity began to burn fiercely in Orthodox Gaul. This was largely due to the example and inspiration of the growing monastic movement throughout the Christian world. Two of the greatest saints of this time in Gaul were St. Hilary of Poitiers and St. Martin of Tours. St. Hilary, known as the “Athanasius of the West,” was the spiritual father of St. Martin. St. Martin is considered Gaul's first great monastic saint. His example of “bloodless martyrdom” through asceticism was embraced by many. St. Martin's particular expression of the monastic life at Marmoutier was naturally harmonious to the soul of the Gauls and served as a catalyst to the spread of Christianity among the people. b.) One of the immediate spiritual fruits of St. Martin's example was the famous Monastery of Lerins. The founding of the monastery on the Isle of Lerins in 410 was the work of St. Honoratus, the future bishop of Arles. The monastery served as a spiritual school for bishops and ecclesiastical writers, such as St. Faustus of Riez, St. Eucherius of Lyons, St. Vincent of Lerins, St. Hilary and St. Caesarius of Arles, and St. Patrick of Ireland. The information that has come down to us about the life of the Monastery of Lerins can be found primarily in the Life of its founder, St. Honoratus, and in St. Eucherius of Lyons' In Praise of the Desert. From these sources one can see that most of the monks lived in community, while the more experienced struggled in an eremitic or partially eremitic way of life. 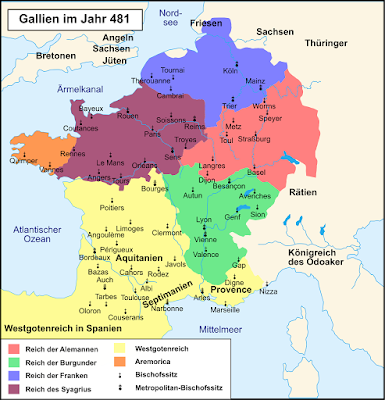 Lerins-style monasticism (which held the anchoritic life in the desert as its highest ideal) spread throughout all of southeastern Gaul, notably in the Jura mountains with Sts. Romanus and Lupicinus, and in the Valais, where the Monastery of St. Maurice of Agaune would remain an important spiritual center for centuries to come. c.) Finally, the spiritual teachings of St. John Cassian must be mentioned. In 416 St. John founded the Monastery of St. Victor in Marseilles. Prior to this in 400 he had been ordained to the diaconate by St. John Chrysostom. St. John Cassian was a great defender of the dogmatic teachings of the Church and carefully articulated the synergy between man's free will and God's grace. His primary labor, however, was to reveal to the Gallic monks the way of life and spirituality of the monks of the East. His Institutes and Conferences, which he wrote for the monks of Provence, are a glorious manifestation of the spiritual fruits he had acquired during his long stay in Egypt among its famous holy men. Many newly founded monastic communities, as well as ascetics who desired to lead the solitary life, used his writings as their spiritual manuals and guidebooks. The monastic rules spelled out in the Institutes were central to the foundation of subsequent monastic typica in the centuries to come, including the later Rule of St. Benedict. Just as monasticism was beginning to put down its roots in Gaul, an event occurred that shook the minds and hearts of the entire Graeco-Roman world: after several centuries of violent conflicts and bloody skirmishes, the Germanic tribes of the north finally sacked the city of Rome. This marked the beginning of a new period in the history of the West, both ecclesiastically and politically, in the challenges it brought to the growing Orthodox Church. 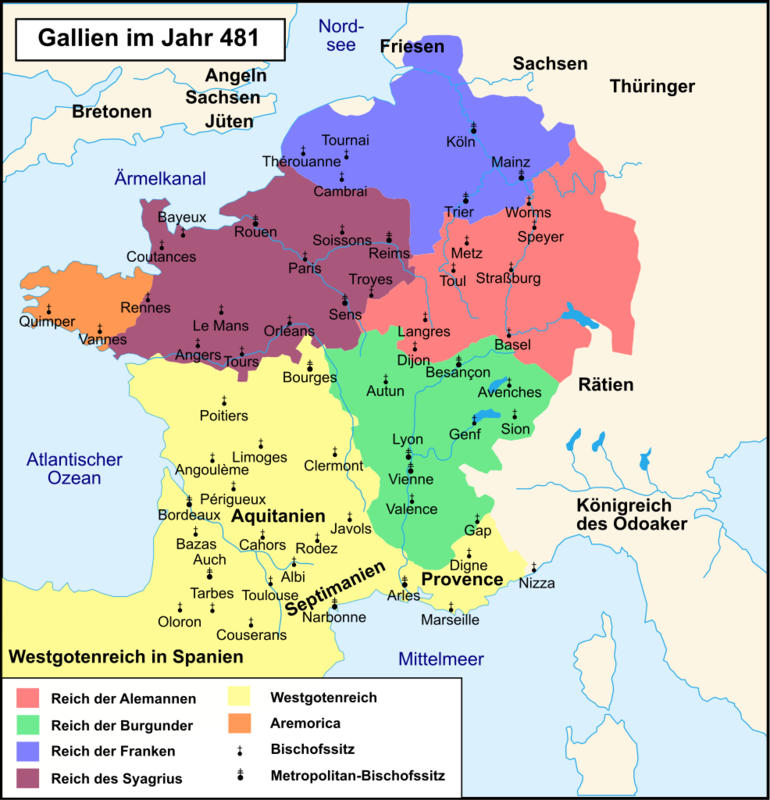 The fusion of the Celto-Roman population in Gaul with the Frankish invaders was facilitated by the conversion of the Frankish King Clovis from Germanic paganism to Orthodoxy in 498, effectively beginning what has come to be known as the Merovingian period in the history of Gaul. While Clovis' intentions may have been good, his actions and practices, as well as those of some of his descendants, fell decidedly short of the Christian ideal. But despite the fact that the behavior of the Frankish aristocracy could often be characterized as brutal, Orthodox sanctity had a powerful influence on Merovingian society. Few eras were as fertile in saints. Saints were numerous among the advisors to the kings; some even belonged to the royal families. One can mention King Guntrumnas (called “the Good King”) of Burgundy and especially the holy queens: Clotilde, Radegunde and Bathilde. It was the holy Merovingian queens who really kindled the fire of women's monasticism in Gaul by founding convents and then joining them shortly before their righteous deaths. Undoubtedly it was the holy bishops of the 5th and 6th centuries who underwent the most painful struggles. This was due to many causes: the impiety of France's ever changing rulers, the opposition of many unconverted pagan (or Arian) Germanic peoples who moved into their sees, and the laxness, worldly ambition and mercenary character of some Christian clerics. Nevertheless, great saints shone forth during these centuries, such as the holy hierarchs Remigius of Rheims, Elegius of Noyon, Aldwin of Rouen, Deodatus of Cahors, Leger of Autun and especially Gregory of Tours. St. Gregory wrote much (over twelve volumes) on the history of Gaul and its saints and sinners. It is from him that we know the most about the Merovingian years in Orthodox Gaul. As the years went by, the Orthodox Christian Faith continued to spread among the people of Gaul. Then, at the end of the 6th century, this process of national conversion received a new impetus from an unexpected source — the monastics and saints of Ireland. Perhaps the best known exemplar of the Irish monastic missionaries was St. Columbanus of Luxeuil, who initiated these “migrations” to the European continent. St. Columbanus and his disciples began their journeys in 590, traveling through Brittany into the heart of Frankish Gaul. By the time St. Columbanus arrived, the political and social conditions in Gaul were altogether deplorable. St. Columbanus and his disciples engaged in some itinerant preaching before approaching the aforementioned St. Guntrumnas, King of Burgundy, and receiving permission to establish a monastery. St. Columbanus chose a location far from the court, in the foothills of the Vosges mountains, at a place called Annegray. Shortly afterward two more foundations arose — those of Luxeuil and Fontaines. St. Columbanus was abbot of all three. For about ten years all went well; the region was deeply and permanently affected by the monasteries and almost all the inhabitants therein were baptized. Then he ran afoul of Queen Brunhilda and was exiled from Burgundy. Though cast out of Burgundy, St. Columbanus was welcomed by other Frankish kings, who were also becoming increasingly alienated from Burgundy. Eventually St. Columbanus and his monks settled at Bregenz, at the eastern end of Lake Constance, in what is now Switzerland. Leaving one of his close disciples there, Columbanus was inspired to preach to the Lombards and crossed the Alps into Italy, eventually settling at Bobbio near the river Po, where he reposed in 615. Other missionary monastics from Ireland included Sts. Killian, Colman and Totnan of Wurzburg in Germany, St. Gall of Switzerland, St. Ursus of Aosto in Italy, and St. Foillan of the Brabant. Throughout Europe the Irish monks established guest houses for pilgrims and travelers in addition to their monastic hermitages, and wherever they went they brought with them — and continued to produce — works of great beauty. Western Europe had suffered a vast loss of learning from the violence of the preceding centuries. The Irish who came to the Continent carried in their satchels copies of ancient texts, some of which only Irish eyes had seen for centuries. Thus, these monks returned to Europe the lost treasures of classical learning, patristic thought, biblical commentary, and poetry by befriending the barbarian Germanic peoples and then converting them by their love and example. By the end of the 8th century many of the Germanic tribes had heard the Good News of the Gospel and begun to convert to Christianity. Most notably, this took place on a wide scale among the rulers, eventually giving birth to the famous Carolingian dynasty, with Charlemagne as its first great leader and formative influence. He sought to institute the “new Byzantium” or “the new Holy Roman Empire” by consciously allying his kingdom with the Pope of Rome, to create an “ideal” or “model” of Christian society that future generations could build upon, both politically and dogmatically. Unfortunately, the dogmatic basis they chose was heretical, and the peremptory manner of both the Church of Rome and the Carolingian rulers enforced and built upon this flawed ideal over the centuries. The unchecked currents flowing from this flawed ideal eventually resulted in the West's separation from the rest of Christendom in 1054. Although it resulted in decisive choices for the future of Europe — choices which would rupture Europe's spiritual unity — the advent of the Carolingians did not put an end to the Roman/Byzantine Empire. The annexationist and unionist aims of the Western powers, which would culminate with the conquest of Constantinople in 1204, did weaken the Roman/Byzantine Empire, but did not destroy it. On the eve of the Turkish conquest of Byzantium, a magnificent spiritual and cultural renaissance occurred during the time of the Palaiologoi, thanks largely to the hesychast movement. Even after the fall of Constantinople in 1453, the continuity of the Roman/Byzantine Empire survived in the Russian Empire, until the Revolution of 1917. When the Russian Revolution took place, the Communist disease quickly spread throughout other Orthodox nations. To save their lives, many of the Orthodox of these lands were forced to flee. Many came to the West. Of the Western nations, France received a very large number of these Orthodox immigrants. These emigres slowly began to share the Orthodox Faith with their neighbors and friends, and began the process of bringing the ancient faith of France's forefathers back to her present-day children. Today one can find Orthodox monasteries and convents dotting the French land, and more and more people are returning to the fulness of the universal Orthodox Church — the Church of St. Martin, St. Genevieve, and all the patron saints of ancient Gaul. May God grant the increase!